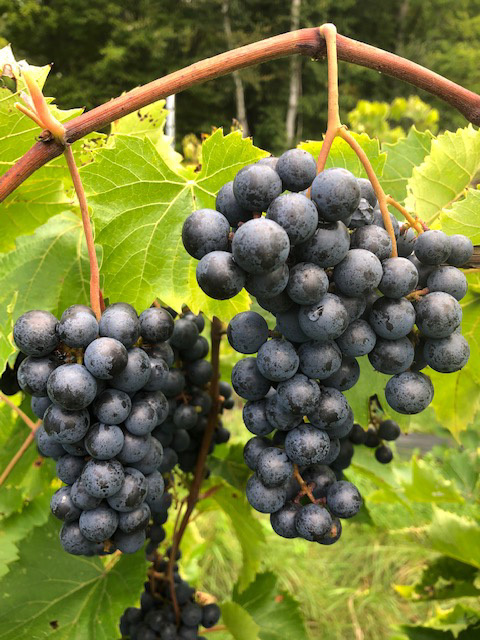 Our Vines - Red Wine | Northeastern Vine Supply, Inc.
PRICING: Quantity discounts apply to the total number of vines ordered, not vines per variety. All prices are for bare root #1 vines. Contact us for pricing on bare root #2 vines. SHIPPING: Shipping charges are billed separately at the time of delivery. TERMS & CONDITIONS: Please review here. This new red wine variety was bred by the esteemed Minnesota viticulturist and author, Tom Plocher. While this variety was just released in 2010 for commercial planting, it has been evaluated in test plantings since it was bred in 1996. Considered fully hardy, producing a full crop after -32F. Vigor is moderate with an open trailing growth habit suitable to high wire training. Bud break is later than any other fully hardy variety. 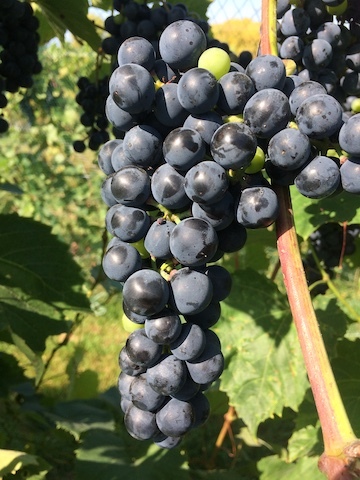 Ripens about 10-20 days after Marquette to around 24 brix and 7-8 g/l acidity. Early wines have been very complex with lots of spice, attractive earthy aromas and jammy fruit. Substantial tannins for a fully hardy grape and a long finish. This may be an excellent blending component to add complexity and softness to most northern red wines. Can also stand on its own. $.80 ROYALTY TO TOM PLOCHER WILL BE ADDED TO EACH VINE. Buyers must sign a Non-Distribution agreement. Cold hardy to -36F. A grandson of Pinot Noir, this selection sets a new standard in cold hardy wine grapes. Very good resistance to downy mildew, moderate susceptibility to powdery mildew and black rot. Semi upright to arching growth habit, suitable to high wire cordon training, but also works on vertical shoot position. Very early bud break, plant only in areas with very good frost drainage. The wine is very complex with black currant, cherry, black pepper and spice in the aroma profile and moderate tannins. TA can range from 9 g/l to 12 g/l and 23-27 brix. This is an excellent choice for medium bodied dry red wine, but can also be blended or make very good rose. Selected by the U of MN. $.75 ROYALTY PER VINE WILL BE ADDED AND PAID TO THE U OF MN. Bears a full crop after -35F. This is a very vigorous vine with immunity to downy mildew and fair resistance to powdery mildew. Black rot must be controlled. Arching in growth, suitable for top wire cordon or VSP. Buds out mid season and ripens late to 25 brix or higher. Wine is garnet in color with an intense cherry, plum and sometimes chocolate aromas. Requires ample heat to reduce its typically high acidity. Frontenac has proven itself very versatile in the winery. 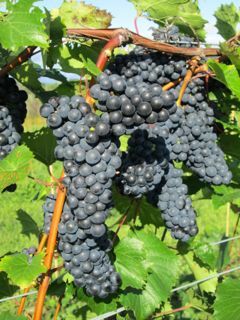 Recently we have seen a surge of Frontenac plantings for making sweet red table wine. This wine category is one of the fastest growing. In addition, medium bodied red table wines, excellent rose or port wines are also being made from Frontenac. Some rose is blended with Frontenac gris for more complexity. And now, vin de paille, or straw wine, is being made from naturally dried Frontenac. Selected by the U of MN. $.25 ROYALTY TO THE MN NURSERYMANS RESEARCH CORP. WILL BE ADDED TO EACH VINE. Hardy to around -22F. Foch is an older french hybrid that has proven itself many times over to be a productive vine in moderate climates capable of producing a wide range of popular wines. Rather bushy in growth, it is adaptable to several training styles. Outstanding wines have been produced from Burgundian reds to rose to Port wine. At its best Foch has some nice tannin and dark fruit aromas. When not fully ripe, it can be slightly herbaceous. Ripens early to mid season. Very early bud break. Widely planted from Nebraska to the coast of Maine. Selected by Kuhlman. BR #2 VINES ONLY AVAILABLE AT THIS TIME. Hardy to around -26 or better. Drooping growth habit is best suited to top wire cordon. Very susceptible to downy mildew. A very reliable grape in the Northeast and Midwest. A yield of 4 tons per acre can be had in colder parts of New England and the upper Midwest, while closer to 8 tons per acre is being realized in southern New England and the Finger Lakes of NY, among other milder locations. Many excellent wines have been made from St. Croix. When harvested between 16-18 brix, it is quite vinifera-like with low tannin and aromas of raspberry, cedar and spice. If left to ripen further, labrusca notes will develop, which can make a nice sweet wine. An excellent lower acid and lower sugar blending agent for other high sugar varieties like Frontenac and Marquette. Ripens early season. Selected by Elmer Swenson. SOLD OUT FOR 2019. Hardy to -35F. This is a sister seedling of St. Croix. Ripens about a week after St. Croix to around 20 brix. Very good disease resistance, this is one of the toughest vines that we grow. Trailing growth habit with strong vigor. This variety may prove useful in areas too cool for most other varieties. Seems to produce better wines in cool years or from colder sites. Sometimes develops off-aromas on hot sites. Wine is dark in color and fruity with nice berry aromas and flavors. Tannin can be fair. Acidity is on the low end and so blending with higher acid varieties is possible. Makes an outstanding sweet red wine which sells quickly. Sulfur sensitive. Selected by Elmer Swenson. SOLD OUT FOR 2019. This new red wine selection is a sister seedling of Petite Pearl, from breeder, Tom Plocher. Crimson Pearl has shown itself to be more winter hardy and earlier ripening than Petite Pearl. This should ripen 10 days ahead of Petite Pearl with about 23 brix, and TA less than 8 g/L. We recommend top wire training. Late bud break, after Frontenac. Early wines have had soft acidity, very fruity, and in some cases with well extracted tannin. Not yet widely planted, but may be reliable where other reds are not ripening. $1.00 royalty per vine will be added and paid to Tom Plocher. Non-Propagation agreement must be signed. SOLD OUT FOR 2019. A new selection from Tom Plocher’s breeding program. Hardy past -25F. Late ripening, after Petite Pearl and Frontenac. Strong vigor, with production of laterals and strong tendrils. Produces large compact clusters with good yield potential. Berry splitting has been observed in some eastern vineyards. Early test wines have shown rather low acidity and substantial tannins. This selection could be suitable for full bodied dry red wines. $1.00 ROYALTY TO TOM PLOCHER WILL BE ADDED TO EACH VINE. Buyers must sign a Non-Distribution agreement. SOLD OUT FOR 2019. Hardy to around -20F. 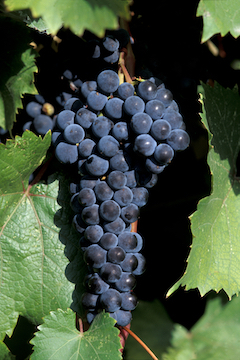 Red grape used to make light red and rose wines. 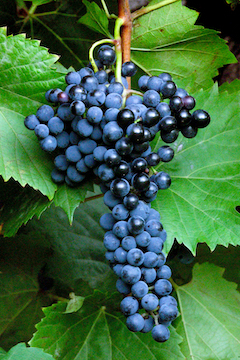 Slipskin, labrusca grapes have a fruity, and distinctly spicy taste and aroma. Makes a very popular semi sweet wine. Mid season bud break and harvest timing. Trailing growth habit, best on high wire cordon. Selected by Cornell. Hardy to around -10F. An old and widely planted french hybrid. Upright growth habit can be successfully grown on VSP as well as other training methods. Late bud break. Late ripening, requiring a lot of heat to fully ripen. Best for the mid Atlantic, central midwest, and western slope of Colorado. Produces deep red wines with a good balance of acid, alcohol and tannin. Can be very productive.